Isola Rossa is the ideal destination for a holiday by the sea, for families with children and those without. Isola Rossa, an enchanting seaside town in northern Sardinia which spreads out along Spiaggia Longa beach, is suitable for all those who are looking for a relaxing holiday and fun. Tourists from all over the world travel here for the crystal clear water and hot sun. Evening, with the sun setting over the red granite island, starts with a pleasant walk along the local promenade. Originally a fishing village, this resort has experienced a significant tourism boom over the past ten years. Apart from beautiful beaches with fine white sand, you will also find here a red rocky coastline and ports where motor boats and larger vessels lay anchor. Isola Rossa offers a full range of services: bars, restaurants, shops, boutiques, a fishmonger, sports and scuba diving centre, pedalo, canoe and motor boat rental, a chemists, medical emergency service, hairdressing salon and “Aquafantasy” water park which is located 1 km from the town. An unforgettable holiday awaits you on the most beautiful beaches of this enchanting island: Longa beach, Li Femini and La Marinedda, Li Cossi beach and Costa Paradiso, Cala Sarraina beach, Lu Litarroni beach, Renna Bianca beach, the beach in Badesi, La Pelosa beach at Stintino and many more. Isola Rossa is strategically placed for visiting the most beautiful locations in northern Sardinia such as Castelsardo, Costa Paradiso, Santa Teresa di Gallura, Capo Testa, Porto Cervo, Arzachena, Alghero, Stintino, Tempio Pausania, Aggius and Sassari. Write to us right now and we will send you our best offer for your holiday! Thanks to the rugged 1,897 km of coastline, Sardinia is one of the Italian regions with the greatest number of beaches, coves and bays. Sardinia will certainly satisfy everybody. You will find beaches here with fine white, pink and red sand, hidden romantic coves, beaches with sand dunes, pebbled beaches and wild crags sloping down to the sea. 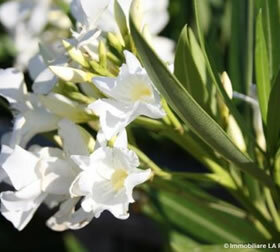 All of them are beautiful and unique and are able to enchant even those who are at home in Sardinia every time they see them. A beautiful beach with fine white sand and crystal clear water located right in the Isola Rossa resort, a stone’s throw from the apartments. Ideal for families with children thanks to the gentle incline into the water. The beach is open to the public. A small part of the beach is equipped with loungers and sunshades which can be rented. You will find a scuba diving centre here, canoe and pedalo rental as well as motor boat and water scooter rental. The smaller Li Femini beach is located next to the tourist port in Isola Rossa and is in particular popular among families with small children thanks to the gentle incline into the water. Only women were allowed to sunbathe on this beach in the past, which is where the name of the beach “Li Femini” comes from (“women” in Gallurese). La Marinedda beach with white sand is hidden in a cove between Isola Rossa and the Li Caneddi headland. It is renowned among surfers from all over the world and an international Surf Contest is held here every year. The beach is open to the public. A small part of the beach is equipped with loungers and sunshades which can be rented. There is a pedalo and canoe rental point here as well as a surf school. 10 minutes’ drive by car, follow signs for La Scalitta in the town of Paduledda. You can also get there on foot (about an hour’s walk), a narrow coastal path leads from the main beach in Isola Rossa. We recommend Li Feruli and Li Mindi beach to all those who are looking for peace and quiet and beautiful countryside. There are usually not many people here, even during high season. A romantic cove with a beautiful pebbled beach hidden among granite crags. A true paradise on earth. It can only be reached by sea or on foot from Monte Tinnari. The natural Li Cossi beach is a true gem with fine white sand, hidden in a cove between red rocks bordered by the emerald sea. The beach is well protected from the wind and you can get to it via a natural path which leads from the car park by the sea at Costa Paradiso. Recommended for all fans of snorkelling. Another romantic cove ideal for sunbathing on the red pebbled beach. Stay until sunset. It is well worth it. Lu Litarroni beach with white sand dunes is ideal for those who want to spend the whole day by the sea. You can hide from the hot midday sun in the shade of a pine grove. The beach is extremely long and the end is popular among nudists and naturists. This beautiful wild cove can be reached via a natural path which leads from Lu Litarroni beach. Rena Majore beach with its fine white sand is located in the location of the same name and is ideal for families with children thanks to its gentle incline into the water. You can hide from the midday sun in the pine grove here. This untouched and wild part of Sardinia, hidden among Mediterranean macchia, will provide you with an unforgettable view of some wonderful countryside. The beach is located in Valle dell´Erica and is certainly worth a visit. You will without a doubt find the most beautiful beaches and coves in Sardinia with crystal clear water in the Arcipelago della Maddalena National Park. The only two islands which can be reached by car are La Maddalena and Caprera (a ferry goes there every day from Palau port). Other islands and islets are only accessibly by sea. The most beautiful beach in northern Sardinia is rightly called the Caribbean of the Mediterranean. Thousands of tourists come here every year to admire the fine white sand and turquoise sea. You certainly won’t be alone here even in May, but La Pelosa is worth a visit even so. Sardinia is one of the oldest geological regions in Europe, boasting a history dating back further than 570 million years. The landscape in the Gallura region is very diverse and offers a wealth of flora and fauna. You will find here rugged coastlines, crystal clear water with fine white sand, deserted coves, hills and mountains covered in granite crags and rare Mediterranean macchia (oaks, juniper, mastic, broom, laurel, oleander, cork oaks, rosemary and myrtle bushes). In this primeval landscape, you can come across wild boar, weasels, foxes, martens, hares, wild rabbits and lizards. Birds worth mentioning include the eastern imperial eagle, the northern goshawk, owls, seagulls, the thrush, blackbird and partridge. The northern coast of Sardinia is regarded as one of the best for fishing and is famed for catching lobster, a local speciality. If you are lucky, you can even come across dolphins here which frequently accompany the local boats. Sardinia has a classic Mediterranean climate which is characterised by summer temperatures for more than 6 months of the year. Temperatures do not fall below 20 degrees from April to October. During the summer months, temperatures reach 30 – 35 degrees. There are two protected areas in the north of Sardinia: The Asinara Island National Park and the La Maddalena Archipelago National Park. Both are definitely worth a visit. The highest mountain in northern Sardinia and the third highest in Sardinia (Monte Limbara, 1359 m above sea level) is only 30 minutes’ drive from Isola Rossa. A panoramic view will open up for you from the Punta Balistreri lookout point over the whole of the Gallura and Luogosardo region. The Monte Limbara region is popular among hikers, fans of trekking and mountain climbing. On the way here, don’t forget to stop off in the place known as Valle della Luna (Lunar Landscape) full of huge smoothed granite boulders, craggy stones and cork oaks. Holidays in Isola Rossa are not only characterised by white sandy beaches and crystal clear water. This is also a strategic starting point for visiting the most beautiful locations in northern Sardinia. This medieval town rises up on a hill over the sea, from where there is a beautiful view, and is ideal for taking romantic walks through the picturesque ancient lanes as the sun begins to set. The remains of the town fortifications and castle dating back to the 12th century which were built by the Doria family have been preserved here. You can visit the Museum of Basket-Making in the historical centre or relax in one of the excellent restaurants or bars. Don’t forget to take a photo of the rock which is reminiscent of an elephant (Roccia dell´Elefante) which can be found on the road into Castelsardo. This old stone-built town is nestled in suggestive countryside known as Valle della Luna (Lunar Landscape) full of huge smoothed granite boulders, craggy stones and cork oaks. You can visit the Museum of Bandits and the Ethnographic Museum in the historical centre. The capital and cultural centre of the Gallura region lies at the foot of Monte Limbara (1359 m) and is a fine example of traditional Gallurese architecture, for which use of grey granite is typical. Together with Olbia, it is the administrative centre of the whole Olbia-Tempio province. This mountain town was already a very important centre during the Nuragic period. As proof of this, you will find several important monuments in the surrounding area such as Nuraghe Maiori, Nuraghe Polcu or La Tomba dei Giganti (Tomb of the Giants) “Pascaredda”. This natural lake with hot springs is a popular destination, in particular if the weather is bad because it is well protected from the weather. On the banks, you will find black thermal mud which you rub on your body and leave to take effectJ The thermal springs originate at a depth of 2,000-3,000 metres and bubble up to the surface of the earth at a temperature of 65 - 78°C. Entry is free of charge. If you prefer covered thermal swimming pools with whirlpool massage baths, follow signs with Piscine Termali di Casteldoria in the town of Viddalba. The spa offers wellness, fitness and a rehabilitation centre. There is a swimming pool here (25 m) with thermal water with a temperature of 27°C. Entry is subject to a fee. 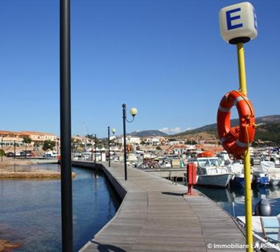 This important tourist port ensures a daily connection between Sardinia and Corsica which are only 12 km apart. Take a walk through the historical centre all the way to the end of the town where the Aragon watch tower Torre di Longosardo dating back to the 16th century rises up into the sky. A unique and unforgettable view will open up for you from here over the whole of the Bocche di Bonifaccio straits which are dominated by Corsica. And also of the beautiful Rena Bianca beach with its white sand and crystal clear water which is only a few minutes’ walk away. 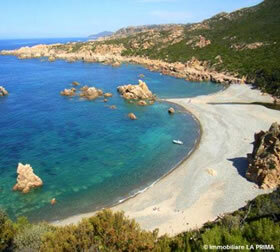 We recommend that nature lovers visit Capo Testa (a peninsular near Santa Teresa di Gallura). This enchanting place, which is truly one of a kind, boasts majestic granite crags which have been smoothed by the wind over the centuries. The Palau port ensures a connection with La Maddalena and Caprera islands (a ferry goes there every 10 minutes). Pleasure cruisers sail from here every day to the archipelago of the La Maddalena national park. The famous “Bear Rock” (Roccia dell’Orso) rises up into the sky a mere 5 minutes from Palau. The rock shaped like a bear is visible from a long way away and this is why it was used in the past as a landmark by sailors. You can now reach this along a nature trail (entry costs 2 euros). 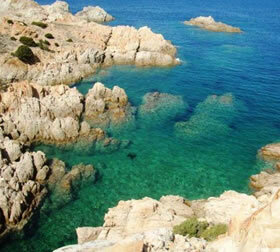 The renowned Costa Smeralda region is popular among VIPs and celebrities from all over the world. It is a 20 km coastal strip full of beautiful coves, bays, beaches and islets. The most famous centre is Porto Cervo (“Port Stag”), where the boats and yachts of the wealthy from all over the world lay anchor. If you are a fan of history, stop off in the town of Arzachena which is surrounded by numerous archaeological monuments (the nuraghes and the Tomb of the Giants). This picturesque port is also known as Little Barcelona and the remains of the Spanish occupation can be found here to this very day. Catalan is still spoken among the local inhabitants. Alghero is famous for its red coral which was until recently retrieved in the surrounding area. The historical centre is surrounded by old fortifications which served as a defensive system for the city for centuries. If you take a walk on the walls, a beautiful view will open up for you of Capo Caccia where the famous Neptune’s Grotto is located. You can visit the cave by boat which sets out every day directly from Alghero or you can drive to Capo Caccia (approx. 15 minutes’ drive) and descend to the cave via the famous 654 steps carved into the cliff. The complex of nuraghes at Palmavera lies on the main road between Alghero and Capo Caccia and is the most important archaeological monument in northern Sardinia. Nuraghes are peculiar to Sardinia. They are circular tower-like structures made from blocks (with no cement) which stand alone or in groups and whose age is estimated to be about three and a half thousand years. You will find about seven thousand of them on the island. A popular tourist location, in particular due to its amazingly beautiful “La Pelosa” beach with fine white sand and colours of the sea reminiscent of the Caribbean. Stintino and Porto Torres are the ideal starting point for trips into the national park and the island of the same name Asinara with an area of 52 km2. A further 10,000 hectares of surrounding sea with beautiful beaches also fall within the sphere of protection of this park. The second largest city in Sardinia and the administrative centre of the province of the same name. Recommended not only for shopping. You can visit the beautiful Piazza Italia square, the Baroque house or Sanna Museum.